Grilled sea bass with buerre blanc, crushed Jersey royal new potatoes with mint, shaved fennel and slow roasted cherry tomatoes on the vine & Vegetarian stuffed courgettes with pecorino sauce. Roast leg of butterflied spring lamb, dauphinoise potatoes, pea, mint, spinach puree, caralmaisedd carrots and rosemary red wine jus. 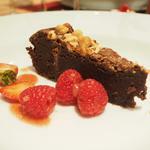 Chocolate Cardamon torte with a red berry coulis. English heritage beetroot honey roasted walnuts and Yorkshire blue salad with rocket and lambs lettuce. Raspberry tart with almonds and vanilla creme fraiche. Chicken supremes served on baby leeks and broad beans, wild garlic potato puree, baby carrots and served with a lemon and thyme sauce. 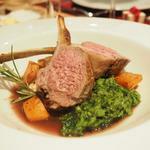 Racks of Yorkshire lamb, served with dauphinoise potatoes, wilted spinach with shallots and garlic, pea mint puree and roasted carrots with a rosemary red currant jus. Slow roasted shoulder of pork with fennel, garlic and lemon, little rosemary and garlic roast potatoes, mango ginger salsa, spring baby vegetables. Oven roasted cherry tomato and dill soup with basil and garlic croutons. Whitby crab Linguine, with chilli and garlic. Seared fillet of Yorkshire beef served on dauphinoise potatoes, green beans with garlic and tarragon, wilted spinach. Pan seared halibut served with salsa verde, crushed new potatoes, chargrilled asparagus and slow roasted cherry tomatoes on the vine. Selection of French, British and Irish cheeses with home made oatcakes and cheese biscuits. Food was simply stunning. Everything was cooked beautifully. Presentation was fantastic too. 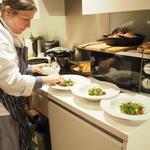 Miranda was recommended by another chef and I have to say every guest was delighted with the food! Miranda herself, was also a delight to work with from start to finish. 5 star food! 5 star service. I have no hesitation in recommending again. Excellent service. Miranda was brilliant from the start, with the menu changes we needed to make, to one person dropping out. When she arrived Miranda was nothing but curteous, made us a fantastic meal and wowed us with extra special touches like flowers on the table and some homemade truffles at the end! The food was absolutely delicious and we could not thank her enough for making our experience absolutely fantastic!! Thank you!! I booked Miranda Martin through the La Belle Assiette website, having never used the service previously. I would have no hesitation in using her or the service again. She made contact to introduce herself shortly after I made the booking, was very pleasant and accommodating with regards to menu changes and dietary requirements. Nothing was too much trouble. She arrived at the holiday rental, fully prepared with ingredients she needed and used the limited equipment and facilities to prepare a truly delicious three course dinner for ten people. She cooked, served and cleaned up after herself; she left the place as though she had never been there! I can recommend La Belle Assiette without reservation! I had a number of queries when making the booking and they were dealt with quickly and efficiently, the staff went out of their way to make the whole process as painless as possible. The chef we chose was Miranda Martin and what a good choice!!. Miranda rang me as soon as the booking was made to chat about the menu and discuss timings etc and was always happy to respond to my texts as we got closer to the date. She genuinely wanted to make sure that we got exactly what we wanted and we're happy with all the arrangements. The meal that Miranda cooked was simply excellent in every respect. We were staying at a rented lodge with an open plan kithen and dining area, space was limited but Miranda was attentive yet discrete. How she managed to prepare, cook and serve the food she did with the restricted equipment and space in the lodge kitchen I will never know! Altogether, a great experience Fantastic food cooked by a lovely lady who also happens to be a talented chef! Miranda was absolutely fantastic. She was really accommodating and the dinner that she made was absolutely delicious. I would highly recommend! A brilliant service again. Easy to book and we were very pleased with how the evenings went. We had rented a holiday home and had two meals by Miranda to celebrate birthdays. 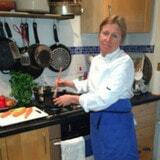 She is an amazing chef and just came and got on with things leaving us to relax and enjoy the evenings. I wouldn't hesitate to book her again if we are up in Cumbria again. And we are looking forward to booking a chef to cook in our own home at some pint in the future! From the minute Miranda arrived she was brilliant. She had already been in contact with me to make sure we had everything we needed to enjoy the evening. She was very pleasant and left the kitchen spotless. In addition, the food was brilliant, she was really friendly and couldn't do enough to assist throughout. I would definitely request for Miranda's availability if I were to use La Belle Assiette again. The chef cancelled this booking 43 days before the event. This is an automated message. Miranda gave us a Christmas day to remember! She arrived promptly, was warm and friendly and got to work with a minimum of fuss. Dinner was served right on schedule and was delicious - plenty of food and everything cooked to perfection. Even though we had a dining kitchen, and as we ate Miranda and her helper were busy tidying, washing up and preparing the next course, they were extremely discrete - we hardly knew they were there. I would recommend Miranda and La Belle Assiette without any hesitation. We had a wonderful day Miranda arrived on time and immediately we felt comfortable with her. She made herself at home in our kitchen and prepared and served a lovely Christmas Dinner for our party of six, topped off with a delicious Pavlova. It was a novel experience for us, but one we would love to repeat. Afterwards, the sheer heaven of not being faced with a kitchen full of pots and pans was a terrific bonus. We were really delighted with everything Miranda provided. It was indeed a great and totally unexpected prize..
We were really impressed with chef Miranda - very helpful in the run up and prepared an amazing meal. We thoroughly enjoyed it and would recommend her to everyone. A very special evening. A very professional service from a lovely person. Thank you Miranda! After a last minute cancellation, we were delighted and mightily relieved to have La Belle Assiete sourcing us a few different chefs. It was an extremely easy process- thank you. Miranda was very relaxed, the house was soon filled with beautiful aromas of cooking and the food was excellent- the lamb in particular was so succulent. I would thoroughly recommend LBA and Miranda- would happily not cook again and do this instead! Miranda was fantastic and the food was perfect, couldn't recommend her enough, she was also very helpful with the menu choice and didn't mind changing some dishes for people with dietary requirements. There was 9 of us and everyone said the same. Would highly recommend, made my 30th birthday a one to remember. 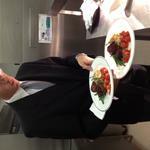 .We booked a private chef to celebrate a special birthday; the experience was everything I had hoped for. I would certainly have no hesitation in recommending Miranda, and I am already looking for an excuse to book her again! Many thanks! Miranda and her helper were very professional. The food was great. I think everyone enjoyed all courses. I was told the vegetarian selection was also very tasty. They also left the kitchen sparkling clean. Thanks for a wonderful evening. Friendly chef with fantastic skills cooked up a great meal for my wife and I. Very aware of the face we had a newborn and gave us time to sort them out between courses. An experience I'll never forget- everything was perfect from the lovely friendly Chef Miranda to the delicious food she served, the time between the dishes and the state of the kitchen after we finished- all perfect and would thoroughly recommend to anyone as so much better than going out to a restaurant. Such a lovely idea and a fantastic experience. Chef Miranda was so lovely and comfortable to be around and the food was delicious! The food that Miranda prepared was exquisite. She was extremely well informed and the overall experience was delightful. Miranda was very personable and we felt very comfortable with her. There were so many lovely little touches, like the butter on the shells and the rosemary with the bread. A wonderful evening! Miranda was the perfect chef, she was in touch lots before the event, which was great. On the big day of my sister bridal shower Miranda was welcoming and friendly, she had kindly agreed to let us help make the canapés, this was such a lovely thing to do and we all had a great time. The food was amazing and we are still talking about it now. I couldn't be anymore happy with Miranda and will definitely ask her back to do more dinner parties for me. My star dish would have to be my venison casserole with Guiness and port and picked walnuts. Three ingredients would be garlic, olive oil and lemon. So good for you and can go in so many things. I became a private chef as I felt it was the best way for me to express my creativity and have now built up a reliable client base. If you believe this content violates or infringes your rights, Miranda Martin may not know. You could solve this problem by contacting him.